Things have been quiet around here because I have been working behind the scenes on something exciting! That is why I have to decided to change things up just a bit. It'l still be mostly quilting and sewing with some other stuff thrown in. But whether I am sharing something I baked, something I have written, or something I have sewn, it would all be By Hilary Jordan. Just like an author or an artist would sign their name to a project! For now you'll just notice the official change on my social media platforms. Since I am handling the website migration on my own, it's a slightly slower process than if I hired someone to do it. I am really excited about this new journey, and I hope you stay on for the ride! Happy Weekend! Today I am so excited to be joining the Fat Quarter Shop & Moda Fabrics for Project Jelly Roll: National Sew a Jelly Roll Day! To be honest, I was not sure what to expect when I signed up to be a part of the FQS blogging team, but it has proven to be loads of fun! 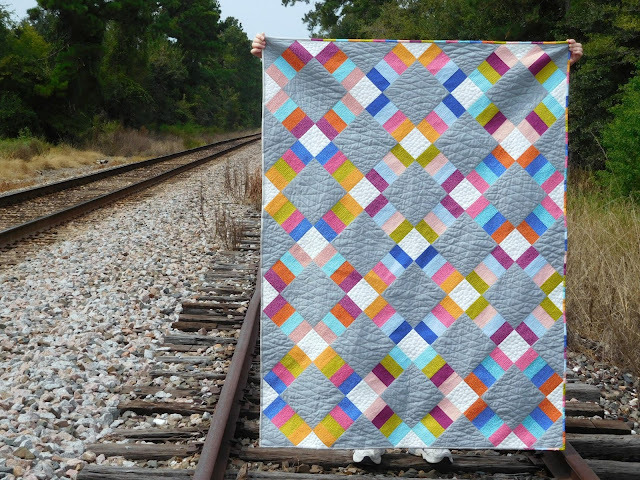 Fat Quarter Shop is actually the very first online shop where I purchased quilting fabric way back in 2010! That project was not my best, I didn't have any idea with a 1/4" seam was at that point in time😉, but it sparked a love of quilting that has not slowed down. The pattern I made to celebrate NSAJRD is the Jelly Roll Railway quilt, a FREE pattern from Fat Quarter Shop! For my fabrics I combined a jelly roll of Just a Speck by Jen Kingwell with Moda Bella solids in grey and white. I decided to leave off the borders that the pattern calls for to give the quilt a more modern feel. I dragged my husband out to these abandoned train tracks in our neighborhood for pictures because a the Jelly Roll Railway quilt obviously needs to be photographed by railroad tracks! One of my favorite parts of this quilt is the secondary pattern created because I chose background and accent fabrics with high contrast. I even had a bit of fun with the binding. Since there were scraps left over from the strip piecing of the blocks, I was able to cut them into even narrower strips and sew them together for a section of the binding. I love the fun pop of color it adds to the edge of the quilt. 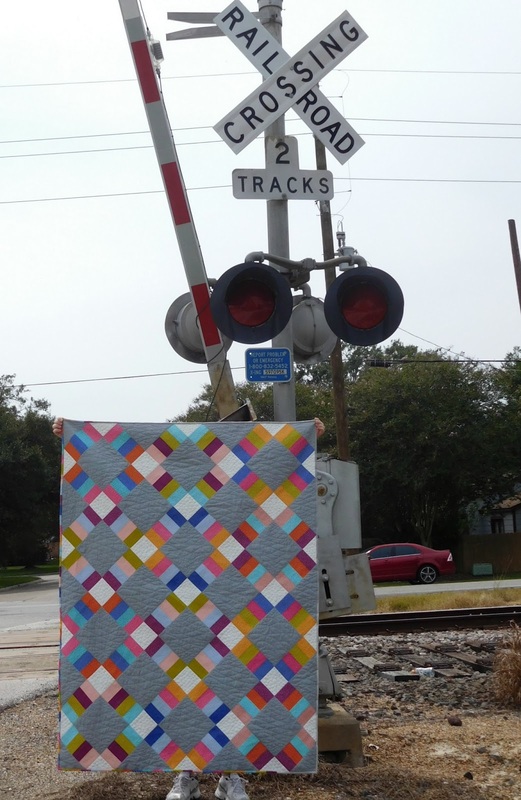 For my quilting I used a whopping 12 different colors of Aurifil 50 weight thread. 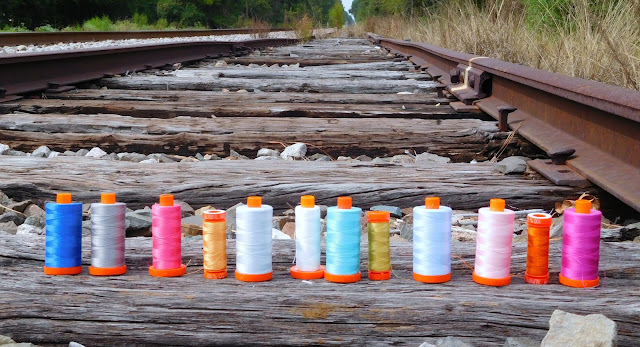 I used so many because I matched the thread color to each of the different fabrics. It required a lot of thread changes but in the end it was totally worth it! From Left to Right I used color numbers: #2730, #2620, #2530, #2214, #2600, #2021, #5006, #2920, #2710, #2423, #2235, and #2535. I had so much fun making this quilt! Be sure to check out the Fat Quarter Shop for all of their other amazing Jelly Roll tutorials!